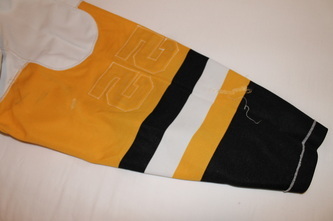 This "Old Two Niner" jersey is from the first set of the 1987-88 season as can be determined by the closed openings on the shoulder numerals. The second set had larger numbers with a visible opening inside the 9s. This jersey shows great wear with heavily shredded sleeves and is a fairly early example from Phil's career in Pittsburgh. 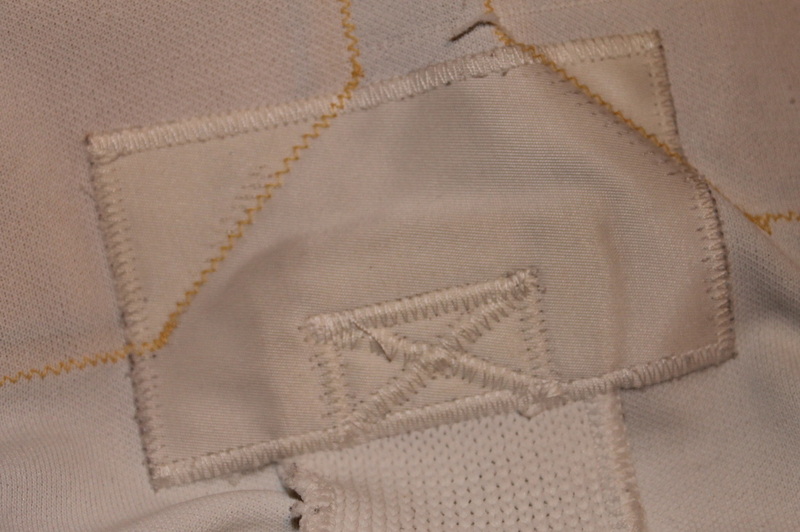 Stick marks are apparent throughout and it's very soft from repeated washings. 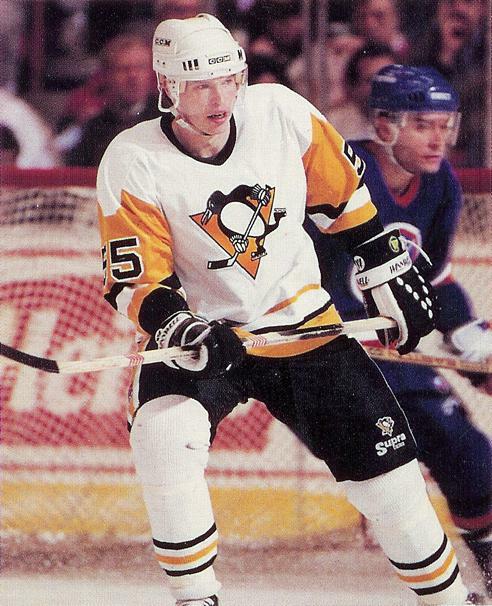 Photomatched to the 1988-89 Penguins media guide. 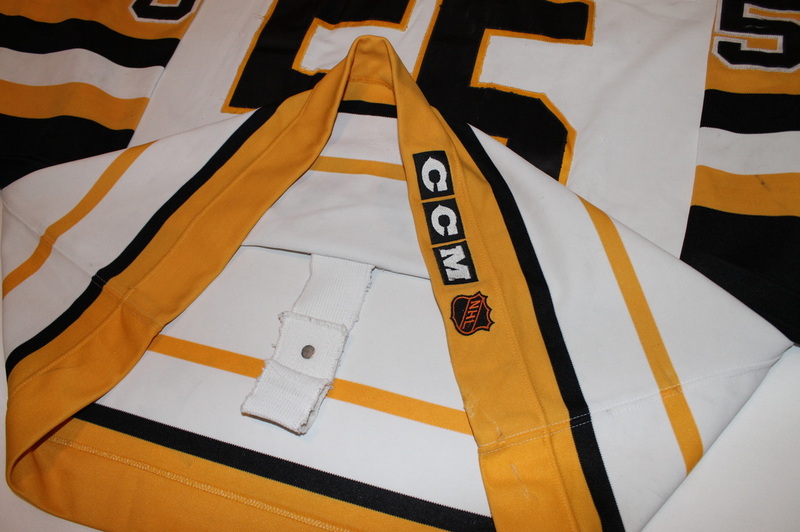 Heavy screened on name and numbering on these jerseys held up much better than most. No signs of cracking or peeling on this jersey despite it's obviously heavy use. 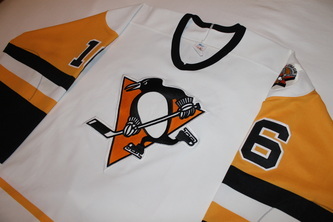 I showed this shirt to Phil at the Pittsburgh expo and he got a real kick out of it. 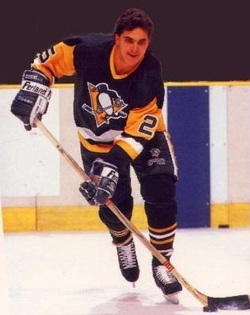 Phil is one of very few players to have played both forward and defense during his career as a Penguin. 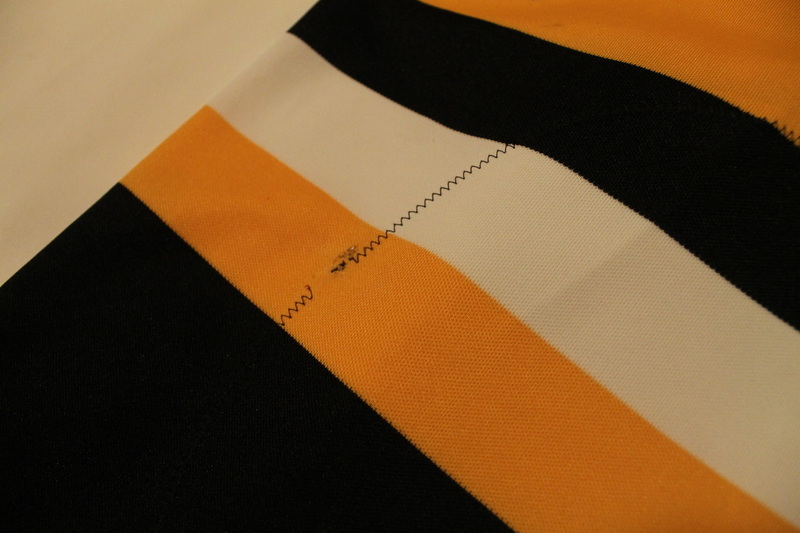 He's also one of the most gracious and polite, willing to sign a beautiful autograph for anyone who asks. He let me try on his 1991 Stanley Cup ring. 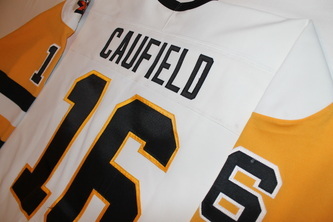 It's magnificent. 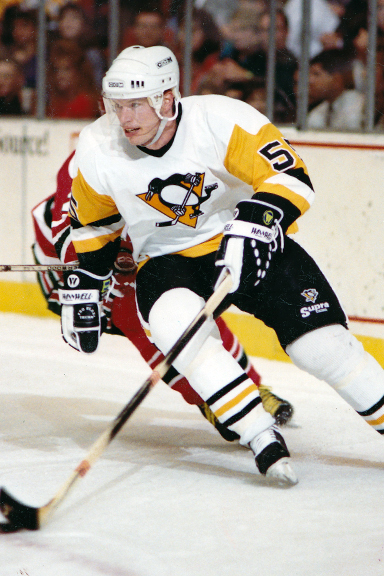 While I had the chance to speak at length with Phil, I asked about the urban legend of his having scribed his name on the inside of the Stanley Cup during his day with the cup in the Summer of '91. He explained he heard something rattling around inside the cup, so he unscrewed the cover on the bottom and found a piece of hardware attaching the top portion of the cup to the barrell had come loose. 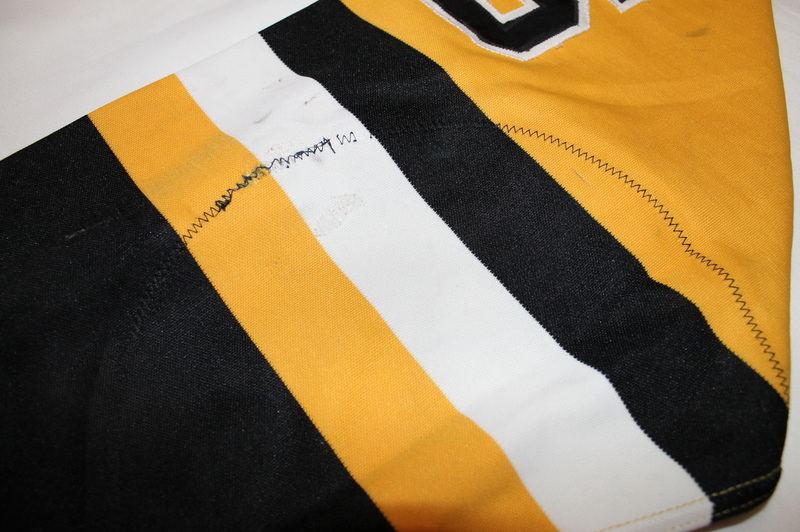 While he was in there "fixing it"...he scribed a crude "Bourque 29" on the inside of the barrell...when he saw the signatures of the engravers enscribed inside. 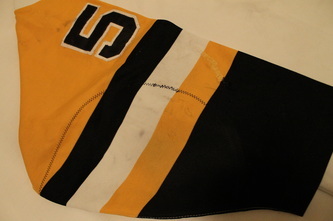 Bourque went on to explain that shortly after he returned the cup it was dismantled for a proper cleaning and repair, where his signature was discovered and he received a call from the NHL. He claims he's the reason there is now a "keeper of the cup" that travels with it on all player's personal days with the cup. 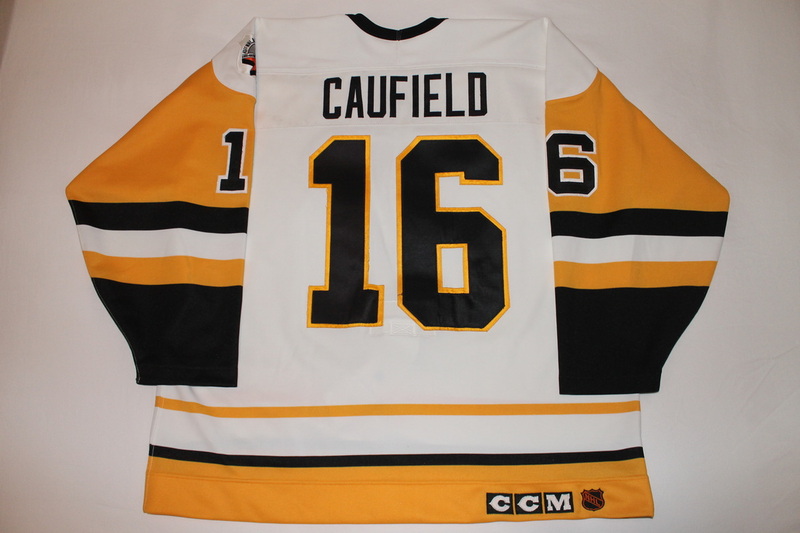 So he can claim he's the only player with his name on the inside and outside of the cup. 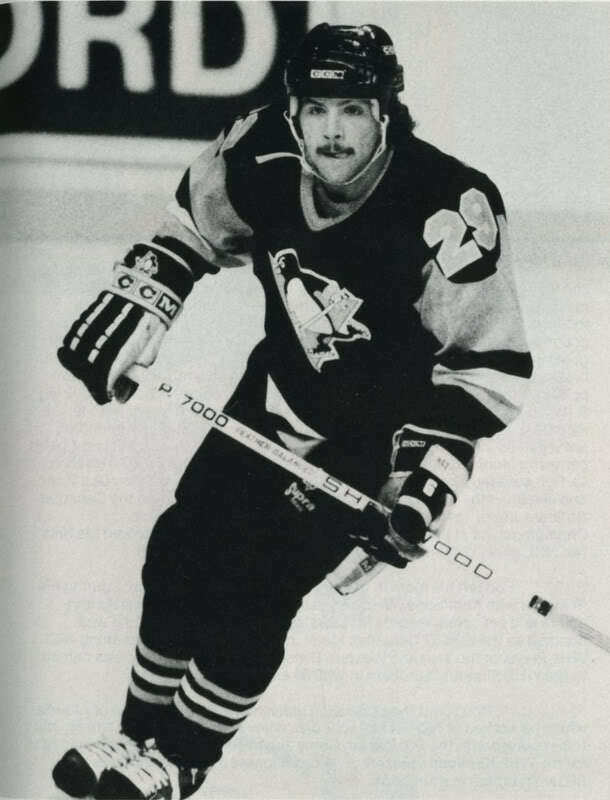 When I showed this media guide photo to Phil, he laughed and said he wore the goofy mustache at the time because the coach had a "no beards" rule. 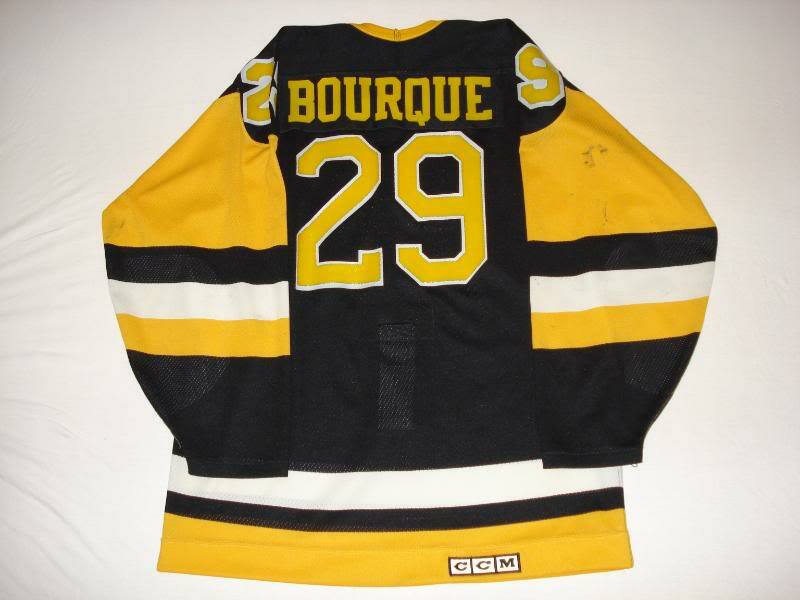 It seems Bourquey was always finding a way around the rules. 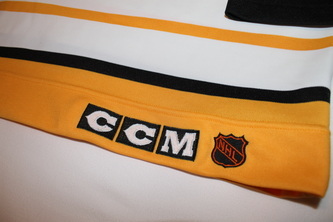 The nameplate stretches from shoulder to shoulder and is sewn below the shoulder seam. 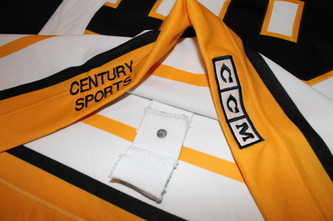 Century Sports and Scrabble style CCM logos are embroidered into the rear hem. 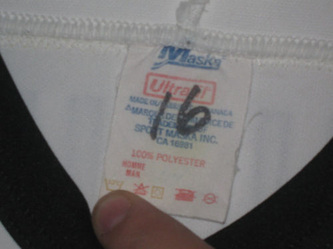 Size 50 still faintly visible on original Maska collar tag, a snug football style fit just the way Jay liked them. 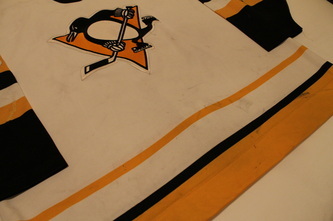 Comes out of a private collection where it had resided since 1991. 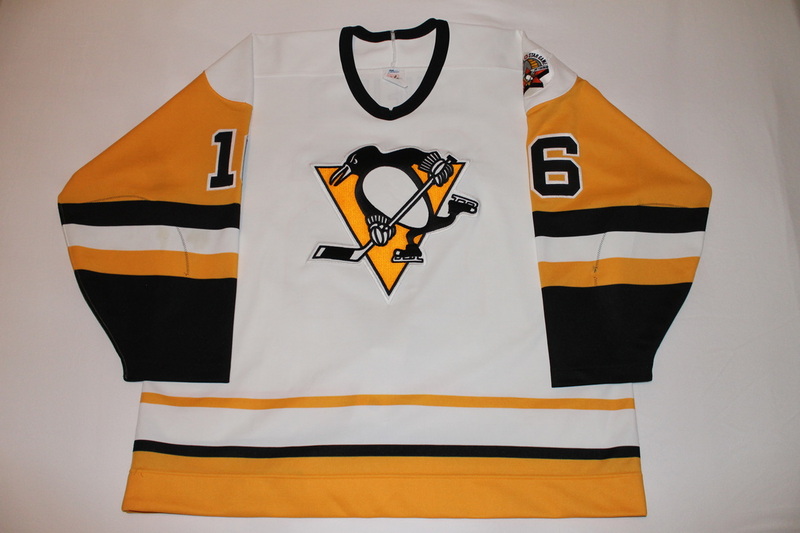 This is a likely a 1989-90 playoff set that was used to begin the 1990-91 regular season after the Pens narrowly missed the 1990 playoffs by losing their last regular season game to Buffalo. The jersey features the highly desireable Civic Arena 41st Annual NHL All Star Game patch on the left shoulder. Shows light wear in the form of a board burn on the elbow, which has broken the stitches of the elbow reinforcement. Latin's handwritten #16 in black Sharpie remains clearly visible on the collar tag. A great looking all sewn, patched, mean crest style from this legendary Penguins enforcer. Purchased from a private Brookyln, NY based collector, this light wear Ultrafil jersey has CAUFIELD spelled out boldly above his famous #16 on a shoulder length namplate. 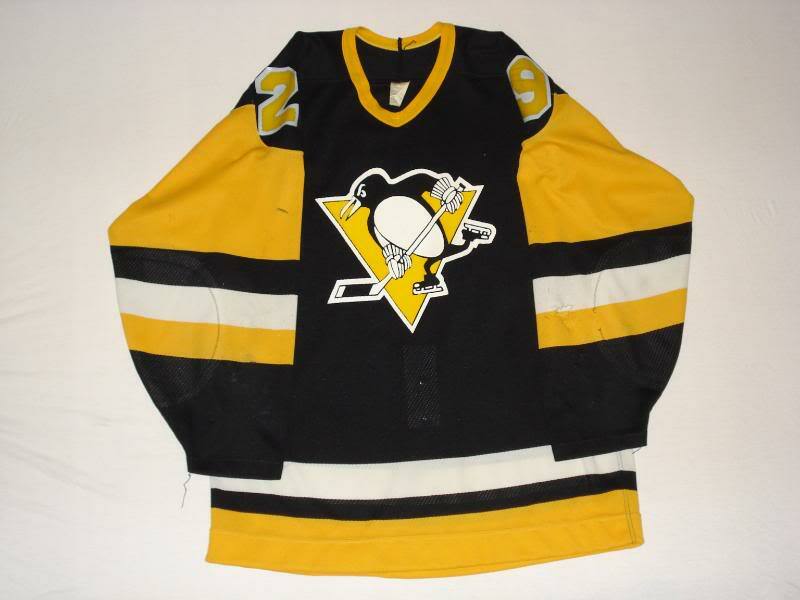 I suspect this was a carryover shirt that was worn to begin the Pens 1st ever Stanley Cup winning season. 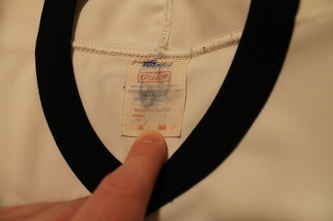 A faint ballpoint pen size 54 remains on the collar tag. 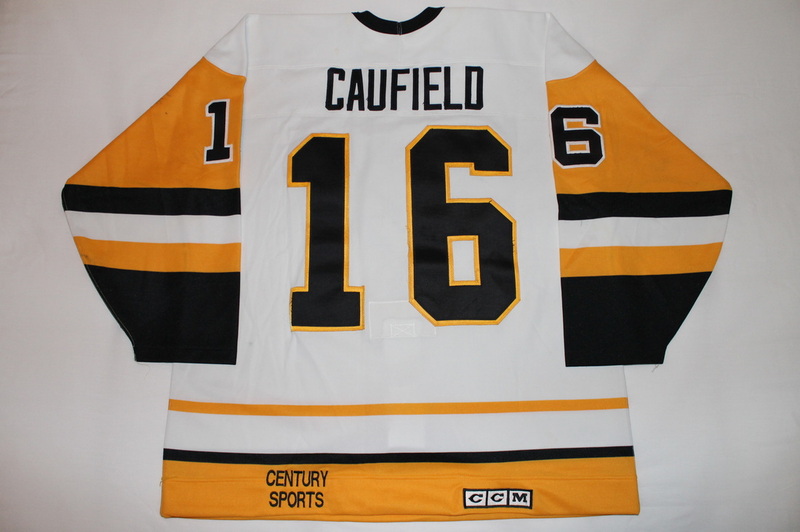 Caufield Pens jerseys rarely seem to trade hands and sewn versions seem to be the most rare. 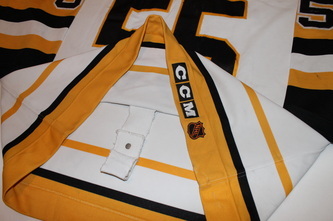 I am proud to add this patched home jersey as the second "Jumpin' Jay" example in the Steel City Gamers collection. 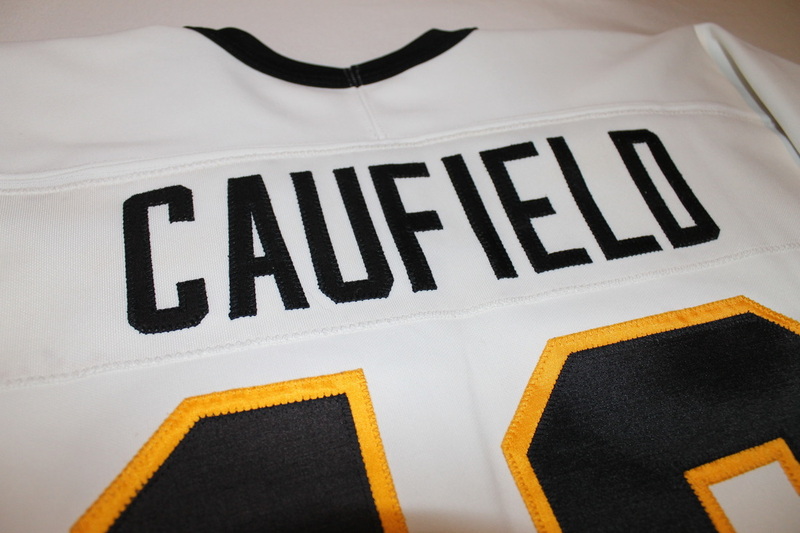 I can never seem to get around to taking pics of this one, but it's a pretty awesome jersey. 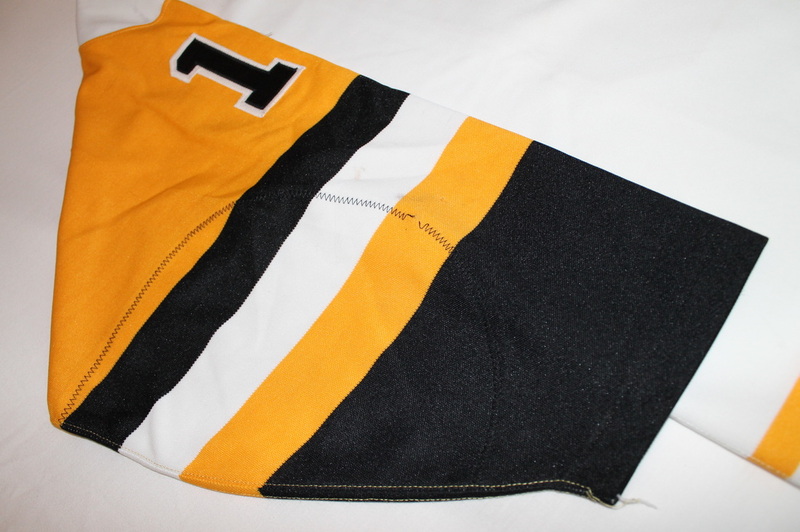 Worn for the 90-91 regular season, when Tommy B was in his prime for sure. 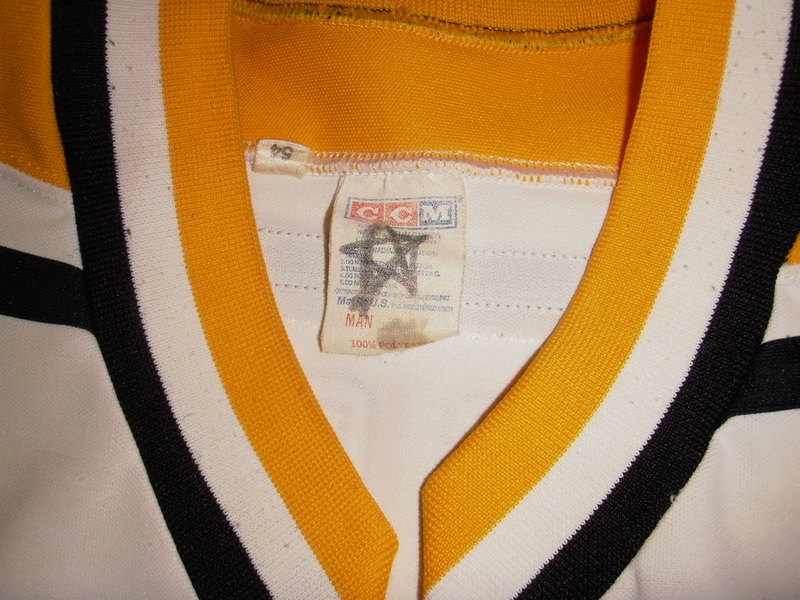 Typical black road jersey devoid of any patches or additional "pieces of flair." 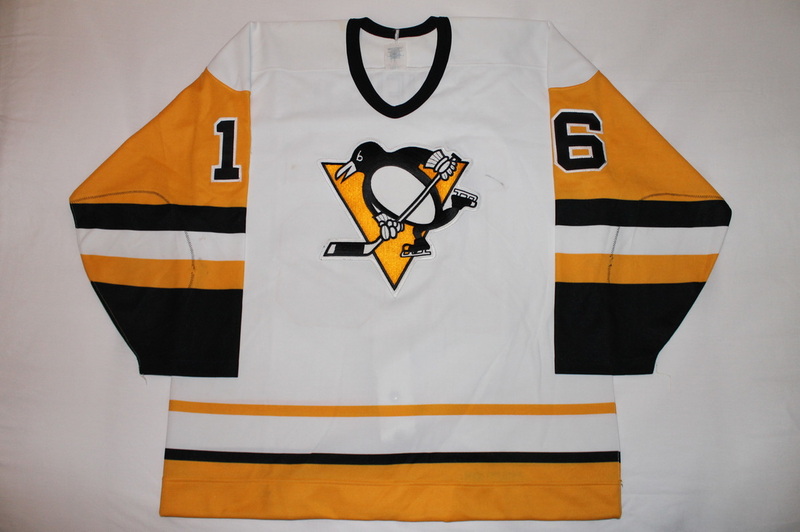 Could this be the best looking Pens jersey of all time? 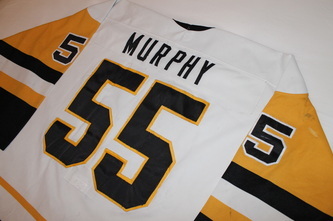 This incredible Murphy jersey is the first #55 he was issued as a Pittsburgh Penguin. 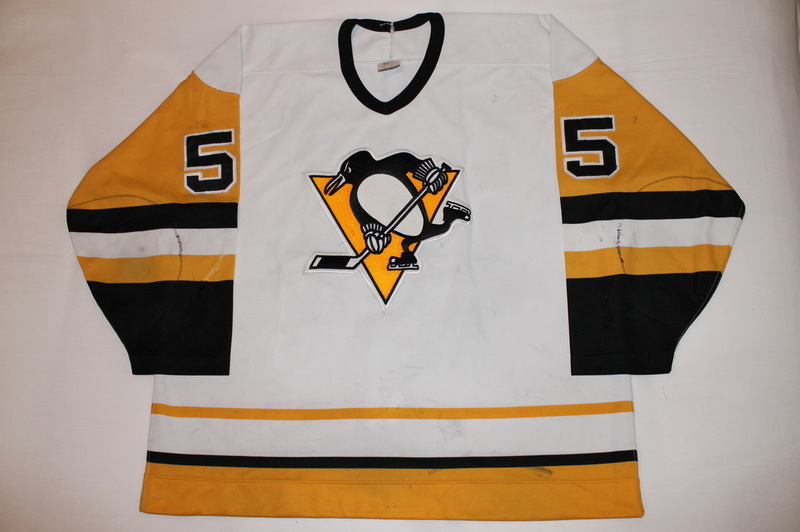 He wore this jersey in his 2nd game as a Penguin on 12-13-90, after wearing #4 in his 12-11-90 debut. Larry was a large man in stature and apparently the Pens didn't have any blank size 54 jerseys in stock when he arrived in Pittsburgh via a trade from Minnesota, so amazingly enough this jersey is actually a recycled Mario Lemieux gamer. 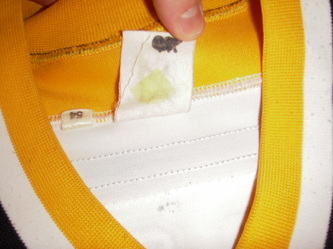 The collar tag has Latin's distinctive Sharpie 66 and there is evidence of both nameplate change and number change. 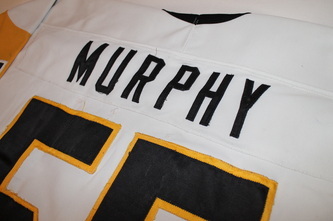 There are repairs below the Murphy nameplate where damage was caused when removing the Lemieux plate. 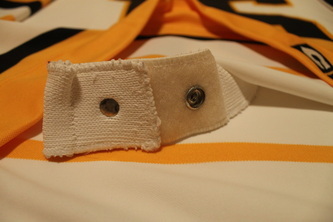 The fight strap reinforcement shows signs of the previous 66 being attached as well. Killed with wear, this Murphy jersey is a standout in the collection. 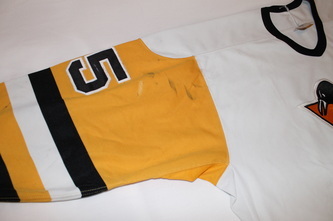 Multiple sewn repairs on both sleeves, below the nameplate, on the shoulder area, and also from removal of the back 66 numerals. 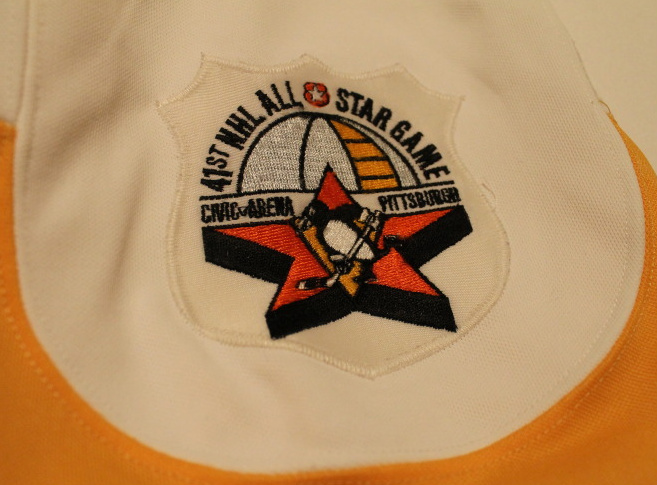 What a cool piece of Penguins history with direct ties to 2 separate Hall of Famers and All Time Penguin greats. 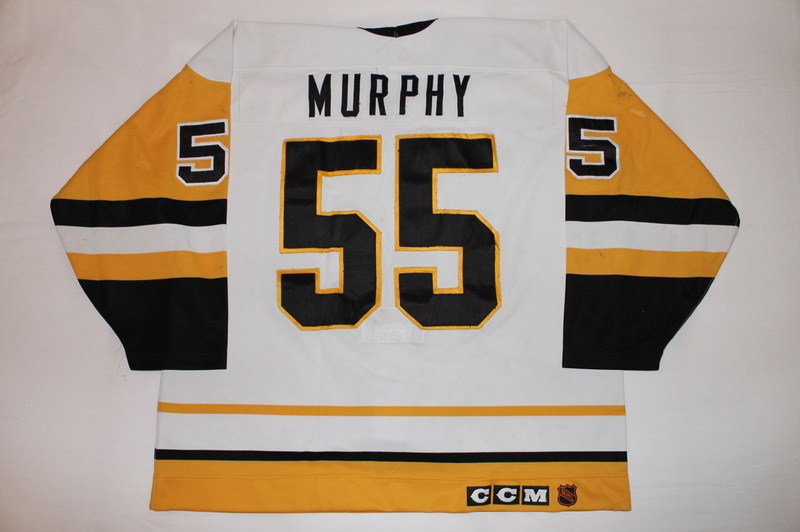 From a very pivotal time in both Murphy's career as well as that of the entire Penguins organization as they'd celebrate their first Stanley Cup Championship just a few months after this jersey was issued. Purchased from a private collector who had owned it since around 1993-94. Special thanks goes out to Casey Samuelson of Penguins Chronicles for helping to photo and video match the jersey. 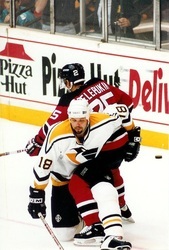 Murphy remains the 5th highest scoring defenseman in National Hockey League history. Learn more about the Penguins "corporate" logo redesign here. 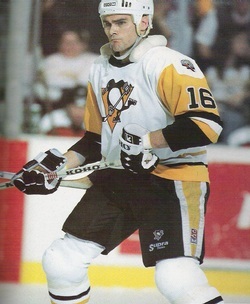 Halfway through the 1999-2000 season hockey fans around the world were shocked to learn about the sad story involving Kevin Stevens. 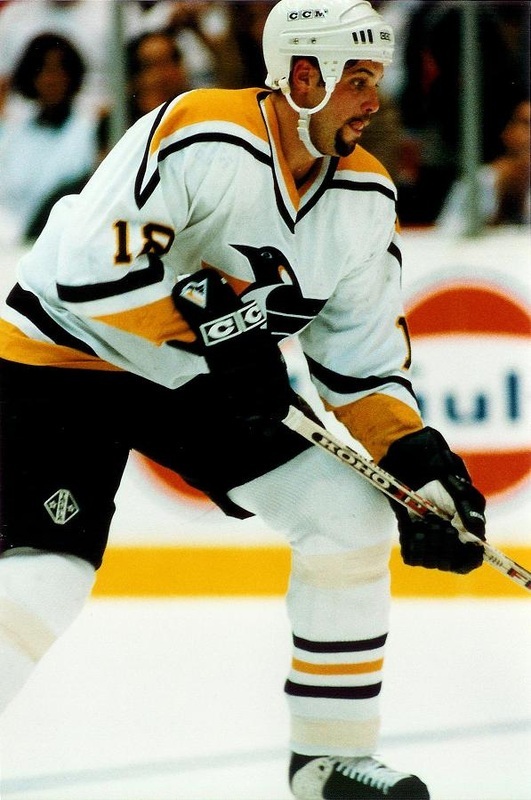 On January 22, 2000 he was caught at a sleazy motel room in East St. Louis with a prostitute, a glass pipe and crack cocaine. 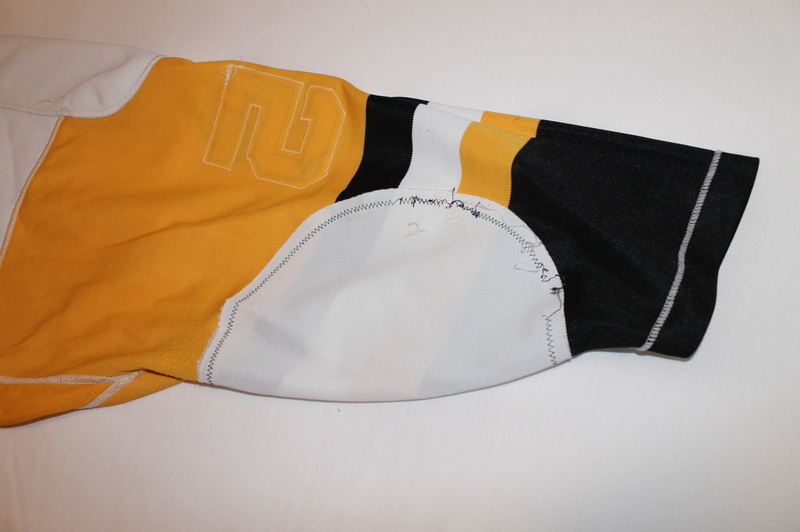 How could an NHL player with a million dollar salary could sink so low? Apparently Kevin had battled problems with drugs years earlier and had been in substance abuse programs. 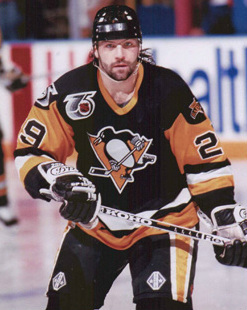 The greatest victims aside from Kevin is his wife (Suzanne) and two children (son Luke and daughter Kylie). Suzanne was pregnant with their third child. This 93-93 Rick Tocchet home jersey shows excellent wear on the form of many stick marks and several sewn repairs. 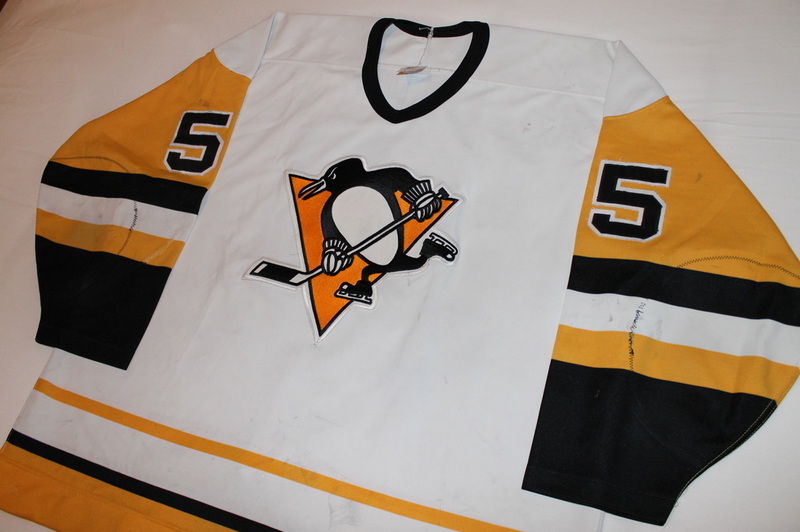 Very proud to have this tough customer represented in the collection, as he was always my favorite Penguin player to root for while watching as a kid. Alternate captain's A still being intact is a rare extra treat. 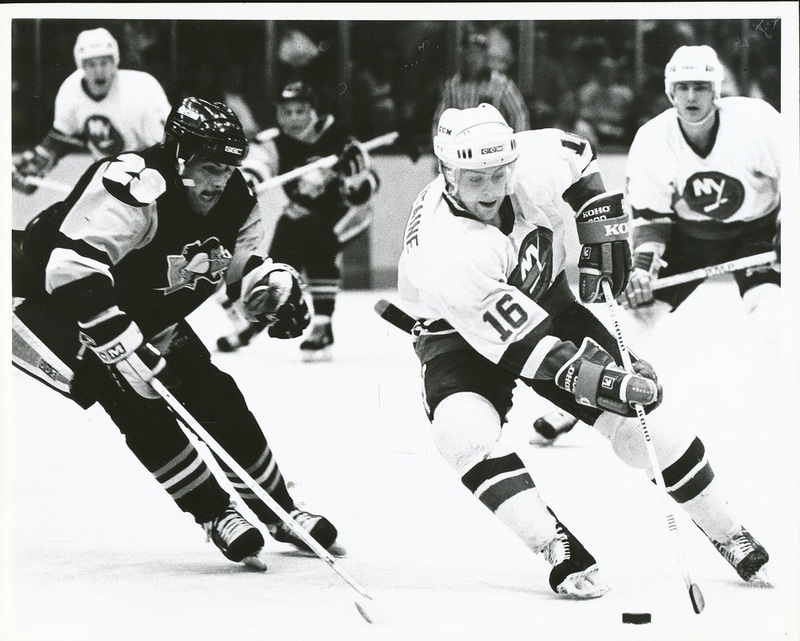 Thanks go out to Rob Fitchett for sending this one my way. 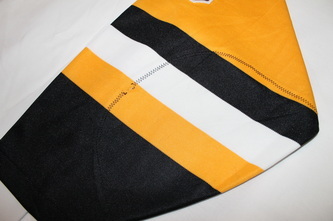 It's immediately one of my favorite shirts in my collection. 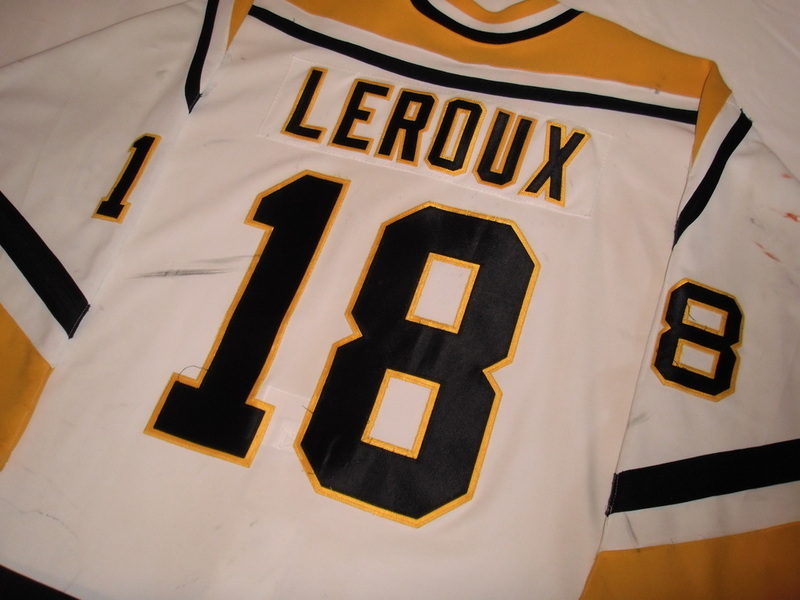 This 95-96 Penguins home white jersey was worn by legendary Pens enforcer Francois "Frankie" Leroux. 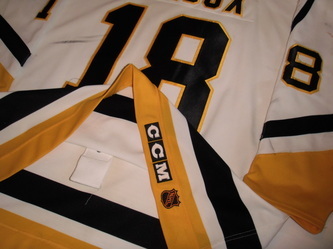 Easily one of the most well worn jerseys in my collection, this one is peppered with stick marks, board burns, unrepaired holes, paint transfers, a popped collar, you name it this one has it. This size 54 jersey also has a strange star penned onto the collar tag where the player # is typically found. Looks another notation blacked out on the backside. 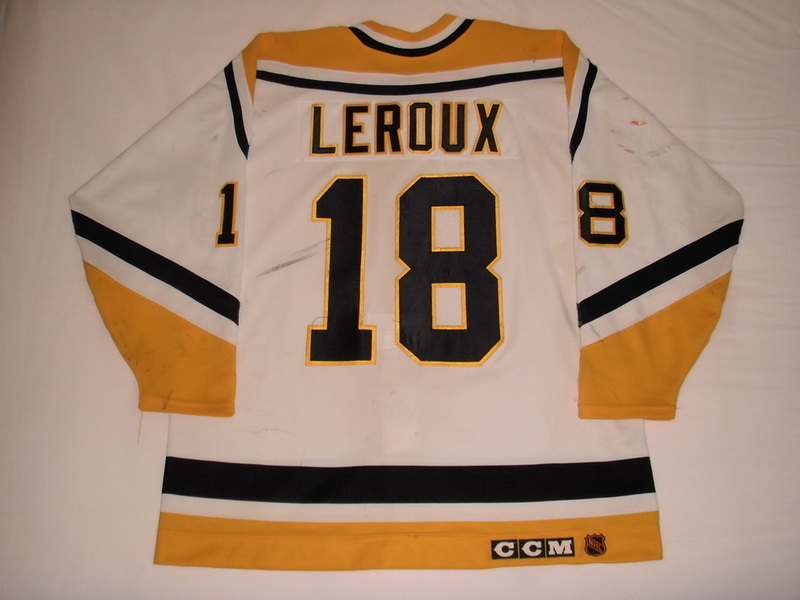 I had been wanting to add a Leroux jersey to my collection for some time, but there aren't a lot of them out there considering the short time he stayed with the team, and his fan base far outweighs that limited jersey supply so his stuff just don't seem to trade hands often. When this shirt became available I snapped it up quickly, as it was not only the legit Leroux gamer I had been waiting for, but the wear on it alone makes it a stand out piece in any game worn collection. 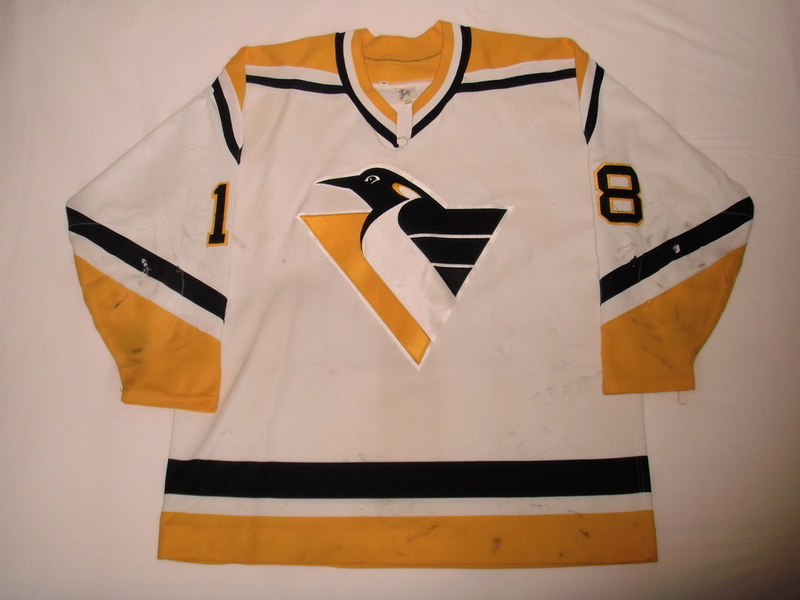 The fight abuse, popped collar, and general filth immediately remind you of the type of game Frankie brought to the Pens. 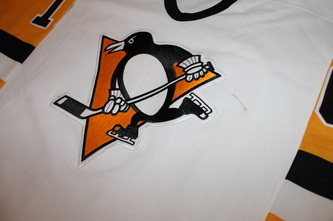 Comes with the original LOA from the Penguins signed by Craig Patrick. An overall outstanding jersey, and a 9+ in terms of wear.